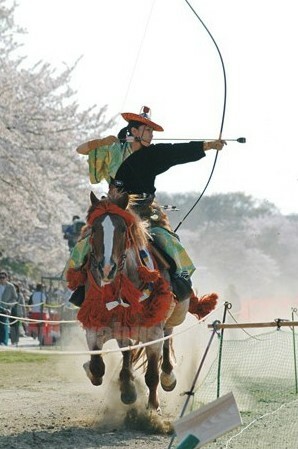 The beginning of archery in Japan is, as elsewhere, pre-historical. The first molded metal images with a distinctly Japanese asymmetrical longbow are from the Yayoi-period (ca. 300BC-300AD). The first written document is the Chinese chronicle Weishu (dated before 297 AD), which tells how the people of the Japanese isles use "a wooden bow that is short from the bottom and long from the top." During these times the bow began to be used, in addition to hunting, in warfare. The changing of society at the end of the first millennium created a requirement for education in archery. This led to the birth of the first kyudo ryuha (style), the Henmi-ryu, founded by Henmi Kiyomitsu in the 12th century. The Takeda-ryu and the mounted archery school Ogasawara-ryu were later founded by his descendants. The need for archers grew dramatically during the Genpei War (1180-1185) and as a result the founder of the Ogasawara-ryu, Ogasawara Nagakiyo, began teaching yabusame (mounted archery). From the 15th to the 16th century Japan was ravaged by civil war. In the latter part of the 15th century Heik Danjo Masatsugu revolutionized archery with his new and accurate approach called hi, kan, chu (fly, pierce, center) and his footman's archery spread rapidly. Many new schools were formed, some of which such as Heki-ryu Chikurin-ha, Heki-ryu Sekka-ha and Heki-ryu Insai-ha remain today. The use of bow as a weapon of war came to an end when the first Europeans arrived in Japan in 1542. During the Tokugawa-period (1603-1868) archery became a "voluntary" skill, practiced partly in the court in ceremonial form, partly as different kinds of competition. Archery spread also outside the warrior class. The samurai were affected by the straightforward philosophy and aim for mind control Zen Buddhism that was introduced by Chinese monks. Earlier archery had been called kyujutsu, the skill of bow, but monks acting even as martial arts teachers led to creation of a new concept - kyudo. In 1896, a group of kyudo-masters gathered to revise traditional archery. 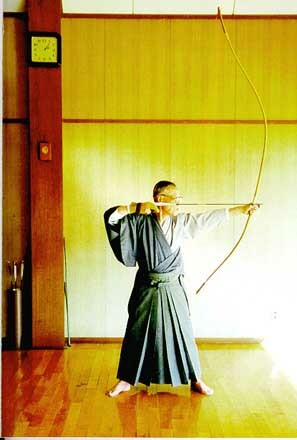 Honda Toshizane, the kyudo-teacher for the imperial university of Tokyo, merged the war and ceremonial shooting styles creating a style called Honda-ryu. It took however until 1949 before the All Japanese Kyudo Federation (ANKF - Zen Nihon kyudo renmei) was formed. Guidelines published in 1953 kyudo kyohon define how in a competition or graduation, archers from different schools can shoot together in unified form. Apart from the shooting technique the schools and styles usually also show some differences in mentality and spiritual approach. Without generalization shomen-style Dojos more likely emphasize ceremonial shooting with meditative background, the Heki-schools (not counting the Chikurin-ha) are rather concentrating on obtaining a high level of shooting skill. The atmosphere in a Dojo, the proportion of ceremonial and "free" practice is depending at least as much on the personality of the leader of the Dojo as on the style, though.